(JUST LIKE) STARTING OVER: A long-lost letter from John Lennon inspires a musical has-been to make big changes in his life. Imagine a filmmaker discovering that a folk singer once received a letter from John Lennon 34 years after it was sent, getting the rights to several of the ex-Beatle's songs, and then having the nerve to revise the story, letter and songs in the service of a feel-good formula fest. Actually, you don't have to. The directorial debut of screenwriter Dan Fogelman (The Guilt Trip) takes every one of those liberties. And yet, thanks to the charm of its cast, it miraculously manages to prove entertaining. Al Pacino stars. The 74-year-old has specialized in "aging" guys for a while now — an aging detective (Righteous Kill), an aging gangster (Stand Up Guys) and an aging actor (The Humbling). Here he's Danny Collins, aging pop star. The movie begins with a flashback to the days when Danny was hailed as the next Bob Dylan. Well, Leonard Cohen, maybe. John Denver, at least. Fast-forward to the present, and we learn that Danny sold out, hasn't written anything in decades and basically settled for being the next Tom Jones. At least he's rich and lives in a glitzy mansion with a woman (Katarina Cas) half his age. For all practical purposes, he's happy. He sings his golden oldies to arenas filled with "golden girls" and consumes as much coke and booze as he did at 20. Then his manager (Christopher Plummer) gives him the birthday gift that changes everything — the letter from Lennon. Apparently feeling that Lennon's writing needed improving, Fogelman rewrote it as schmaltz about staying true to one's art. (The real-life note addressed a different subject.) Reading this missive inspires Danny to undo the mistakes of a lifetime, so he's off to New Jersey. There he has a Steinway shoehorned into his hotel room so he can create, flirts with the manager (Annette Bening) and embarks on a mission to bond with the son he's never met. Bobby Cannavale does a really nice job with that role. It's amusing to watch the 40-year-old son's bitterness incrementally give way to something approaching acceptance. As his wife, Jennifer Garner likewise makes the most of familiar, frequently cornball material. Naturally, the couple has a child with special needs, and Danny uses his celebrity to get the kid into a special, super-expensive school. Pacino dials the hoo-ah down, letting his smile and charisma do the heavy lifting. Naturally, it doesn't hurt that all the feeling and healing are accompanied by a soundtrack of Lennon songs. With the exception of "Cold Turkey," they're randomly placed — but, hey, it beats listening to a soundtrack of Danny Collins songs. Apparently feeling that Lennon's music needed improving, too, Fogelman actually rearranged compositions here and changed a lyric or two there, using a sound-alike. I couldn't believe my ears. Aren't you supposed to be a poet before you take poetic license? The bottom line: A heart-tugging trifle is elevated by the chemistry of its cast and a score that truly was a score. The rights to Beatles music, solo or otherwise, are famously difficult to secure, and Fogelman made the film with no reason to believe he'd get to use those songs. Without them, he would've had a Lifetime movie. So how did a novice director whose résumé includes the screenplay for Fred Claus acquire permission to use nine compositions? Trick question — he didn't. One of the film's producers, Jessie Nelson, happens to know Yoko Ono and showed her a rough cut. Deeming this weepie about a lost letter a love letter to Lennon, Ono agreed to let the songs stay. 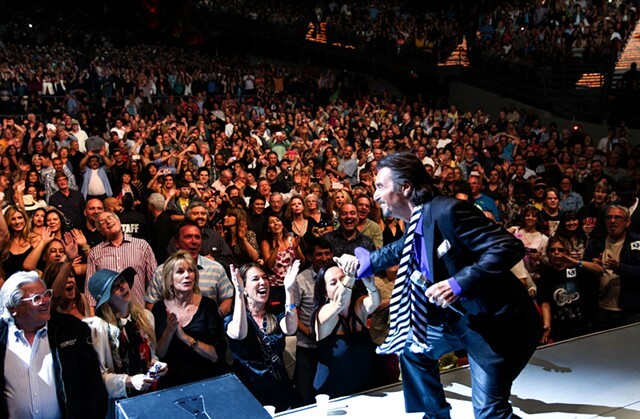 Danny Collins is by no means an instant classic, but you've got to admit that's some spooky instant karma.